These scones almost didn’t make it. I’ve used this recipe for years, so I only casually glance at the ingredient list as I throw things into the mixing bowl. When I reached the final ingredient and started stirring in the heavy cream, the batter just wouldn’t come together – it was dry and clumpy. Undeterred, I figured I just needed a little more liquid and added a few more splashes of cream. Nope. That didn’t work. In a panic, I check the recipe, convinced that I must have needed read the measurement for the cream wrong. I read something wrong, but not the cream. The recipe called for a full cup less flour than I had added. At this point, I didn’t have enough ingredients or time to try again or make something else. After some hasty calculations, I figured out how much I needed to add for all of the other ingredients in order to get the recipe proportions correct. In the end, tea time was saved, but I had a LOT of scones. Two thirds more than usual, to be exact. However, an overabundance of scones is something I can deal with. Is there really such a thing as too many scones? I don’t think so. These cranberry scones are the perfect addition to your breakfast or afternoon tea time. They come together quickly in a single bowl and don’t even require cutting in cold butter. 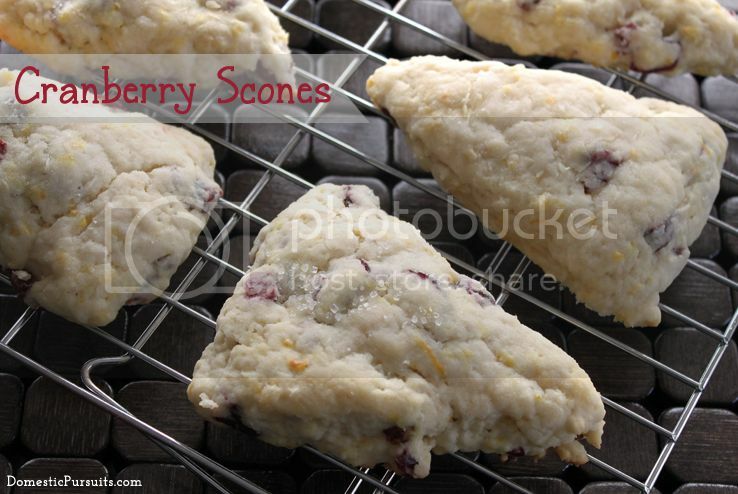 The resulting cranberry scones are tender and not too sweet – just the way a scone should be. Place the granulated sugar in a large bowl and add the orange zest. Whisk until the sugar is uniformly moistened by the zest. Add the flour, baking powder and salt, whisking to combine. Stir in the dried cranberries. Pour in the cream and, using your fingers or a fork, stir together until combined. Pour dough onto a lightly floured surface and lightly knead to bring dough together. Pat into an 8-inch circle and cut into 8 triangles. Place triangles on prepared baking sheet and sprinkle with the granulated sugar. 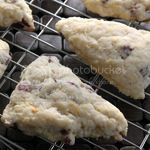 Bake for 15-20 minutes, or until the scones are just lightly browned. Transfer to a cooling rack to cool completely. Store at room temperature.